This is my opening post in a series to discuss approaches to the framing of paintings. This first one is a response to William McAloon’s post: Freedom to act and takes his blog post as a point of departure. I look at some of the issues involving the sympathetic framing of modernist paintings, and what we did with two such works. I have been thinking a long time about framing the art of Colin McCahon. That the artist worked steadily throughout his career to rid himself of the frame, offered up some challenges. That black be used to frame his work offered up another; both the artworks referred to here came into our collection dressed in black frames. relate the painted surface to the democratic white wall. He also wanted to release the painting from “the accretions of the past” implicit in the formal traditions of framing. It is often not possible to return the paintings to their original and minimal supports, to simply pin them to the wall in the manner that he first presented them. 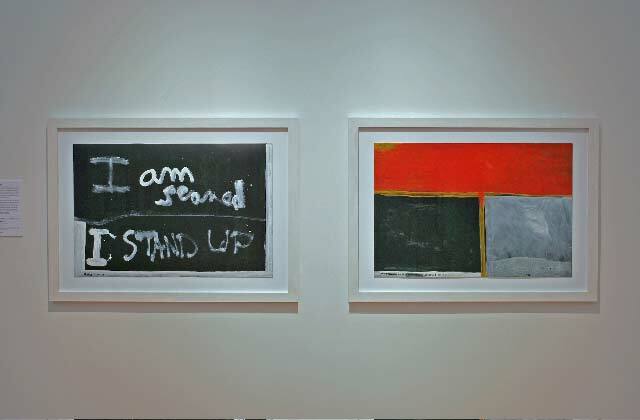 Like all McCahon’s work on Steinbach paper, these ones are so reductive as to ask for the merest method to hang them. They are made of a few blocks of highly articulate colour, and McCahon exhibited them simply pinned to the gallery walls with thumbtacks. In his last years McCahon often used this high quality, quite stiff paper together with acrylic paints. With these materials he expressed a vulnerability in appearance reflecting the content and motivations of his art. The clean edge of the paper suited the clarity and simplicity of his painterly choices. The characteristics of the paper provided just enough stiffness to give a stable but not dead flat platform. This coming together of material and subject is both direct and elegant in the extreme. Artists’ intentions are, or should be, the light by which we consider how a particular work could be framed. McCahon himself acknowledged that the market, current understandings, and the individual motives of owners left their marks in the way his works were framed. Such methods often compromised his intentions, probably forever, especially when they involved sticking the work down, irreversibly, to a hard support – as ours were. Acquired from different sources, they both arrived in black frames and mounts. I think that framing works like these, and framing them in a black surround often works counter to the intentions of the artist and so can come between the artist and the viewer. This is particularly true of McCahon’s paintings where black predominates. The expressive articulation of large areas of black is one of his great artistic accomplishments. When an adjacent frame is also painted black, this can interfere with the quality of the viewer’s experience of his work. Also, the edges of a work of modern art can become blurred by an imitative surround. The experience may become visually destabilising and thus more difficult for the viewer, and doubly so when the wall adjacent to the frame is white. Our newly acquired works were already stuck down, one on hardboard and the other on stiff card. Since the extra supports could not be unstuck they had to be accepted into the framing solution. I wanted the frames to be as recessive as they could appear, so that the paintings could still have access to the white wall, and for their edges to be plain and unambiguous. The solution we chose was to use white materials – mat board and gessoed wood [traditionally, gesso is a mixture of chalk or gypsum and animal glue], and the use of the golden section in scaling the elements http://en.wikipedia.org/wiki/Golden_ratio. Low-reflectance glass was used to protect the works with minimal interference from reflection. To start the process I had to decide the minimum depth required to fit the paintings and their support materials to the wall. The answer to this question was then subjected to some maths. I multiplied the minimum depth by the golden ratio (1.618) for the width of the frame section, and then multiplied the frame width by the golden ratio to determine the width of visible mat at the edges of the artworks. The flat unembellished white frame keeps faith with the modernism of the work, and the harmony required for the essential condition of balance or centredness in the works comes through relatively unaffected. The end result we all feel was very satisfying. With the increased sense of access to the paintings, we felt encouraged to stay and think about the artist and his work. I hope you do too! We have an interview with McCahon in the House where he chuckles as he explains that he had begun to sign his works up against the very edge of the paper/canvas to discourage people from framing them. Thanks for your apposite comment, Cynthia. I can hear his wonderfully evil chuckle ringing in my ears.